Microsoft started rolling out new improvements for its Smart Search feature which allows more of a natural language approach and provides relevant results. Since Microsoft is putting more emphasis on the services you use everyday, the company can make enhancements behind the scenes to its platforms such as Bing. That allows the company to implement improvements to the services like Bing or OneDrive, and it doesn’t require you to download an update to get it. This week the company announced that it is rolling out enhancements to its Bing Smart Search. This is what you use in Windows 8.1 to find files and locations on your computer, as well as search the web. The biggest improvement to Smart Search is you can use more more of a natural and get results faster. Have you ever tried to get something done on your device but you weren’t exactly sure what you were looking for? For instance, how do I take a screenshot or how do set-up a printer? Based on the most common tasks people perform on Windows 8, we are taking steps to allow Smart Search to showcase results based on natural language understanding. Now when I search for “install a printer”, Smart Search will show me that the function resides within “Device Settings” so I can take action with a simple click. Microsoft has also improved Bing to better handle common spelling mistakes, and showcase more apps that might be relevant for your search query. I tested out a few of these natural language search ideas, and I have to say it works very well. It’s worth mentioning that it’s easiest to bring up the Smart Search box is hit the Windows Key, and from the Start screen just start typing your query. Or if you’re ion the desktop, Use the keyboard shortcut Windows Key + S. You can do this in either the desktop or Modern environment. 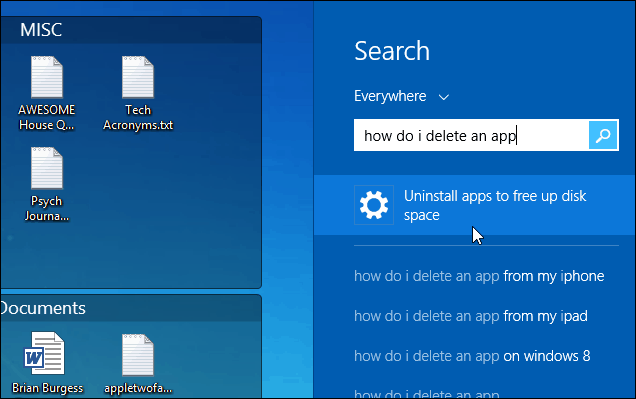 For example, here I typed: how do I delete an app and the first result shows the icon to uninstall apps to free up disk space. Click the result and you’ll be taken right to where you need to be. You’ll be in the App Sizes section where you’ll see your installed apps and the size of each of them. 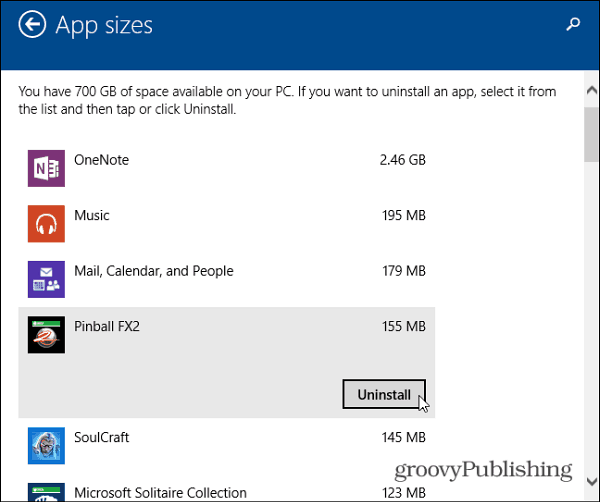 Just click to uninstall one you no longer want. The other day I wrote the article: How to Manage Modern Apps and Free Up Disk Space. In it I demonstrate the long way of getting to the App Sizes section. With the new Smart Search capability, it would be easier to just use it. It’s not always going to provide the result you need as the first in the list. In this example, I typed: how do I take a screenshot. And since I write hundreds of How to content, it found a couple entries for titles of my articles. Depending on the various file names on your system, results will vary. 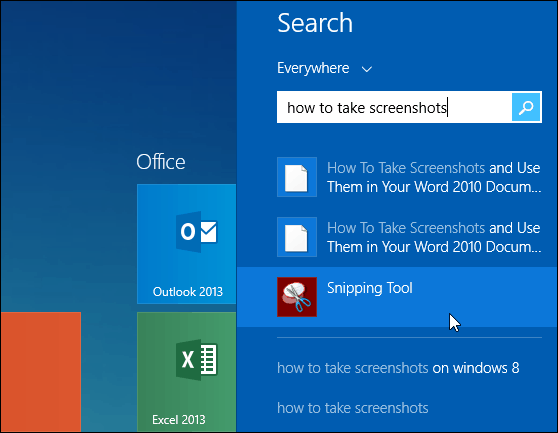 But notice it did bring up the Snipping Tool which is a screenshot utility baked into Windows. I’ve been playing around with this new feature, and not everything works as you’d expect. For instance I typed: how do I listen to music – I would think Xbox Music or Windows Media Player would have been in the results, but neither was. The Microsoft Search Blog provides other examples you can check out and test yourself. I would assume this feature will only get smarter and should be more useful over time. Remember, that Bing isn’t just a search engine on the web. It’s a platform that integrates deeply in Windows 8. One of the new features of Windows Phone 8.1 is Cortana – Microsoft’s version of Siri. Cortana is completely powered by Bing, and after a few set up screens, Cortana will have information that’s relevant to your likes and interests right away in the morning with the push of a button. I think of it as a smarter Siri with more personality than Google Now. It also uses natural language. For example, I can say: Do I need to wear a coat today. Cortana will come back and tell me the current temperature and forecast for the day. These new search improvements on both devices should be welcomed by new users who aren’t tech Savvy. And especially for people who are new to the Modern interface. And over time, Smart Search will continue to get smarter, and so will Cortana. Wow, search that actually provides the solution to the question. Now that sounds handy!